Where to start? This should be more like 3 or 4 posts but I’ve been busy with work and family so I haven’t been updating the blog like I should. So here it goes. 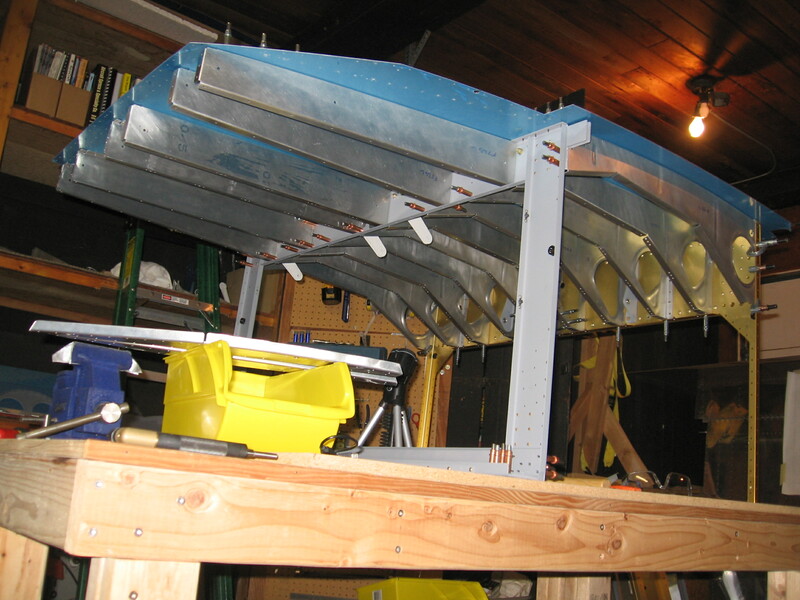 After finishing the center section riveting, I drilled the 715 ribs on each side as well as all the floors. The center section then got flipped back over and reattached to the 706 bulkhead. 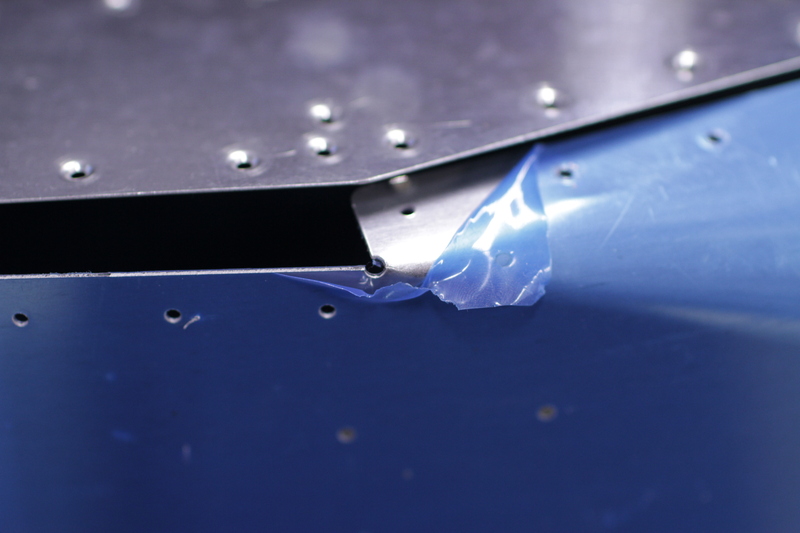 Attaching the 770 side skins was very challenging. I had a hard time getting the holes to match up. It took three days of searching the forums and builder sites for advice to arrive at the solution. You have to basically raise the rear fuse just behind the 706 bulkhead by a good 8 inches. 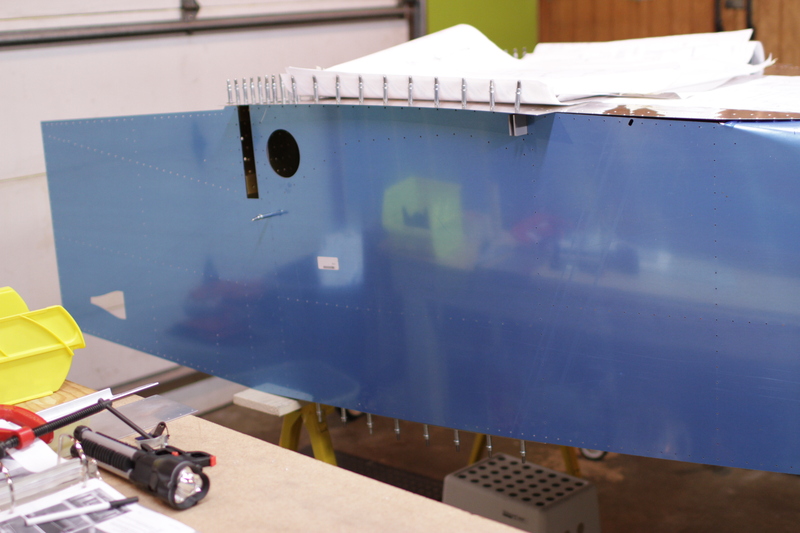 This spreads the longerons a bit and gets those rear holes in the 770 skin close enough to the aft fuselage holes that you can get some clecoes inserted. After that it was time to match drill the arm rests. Pretty straight forward. 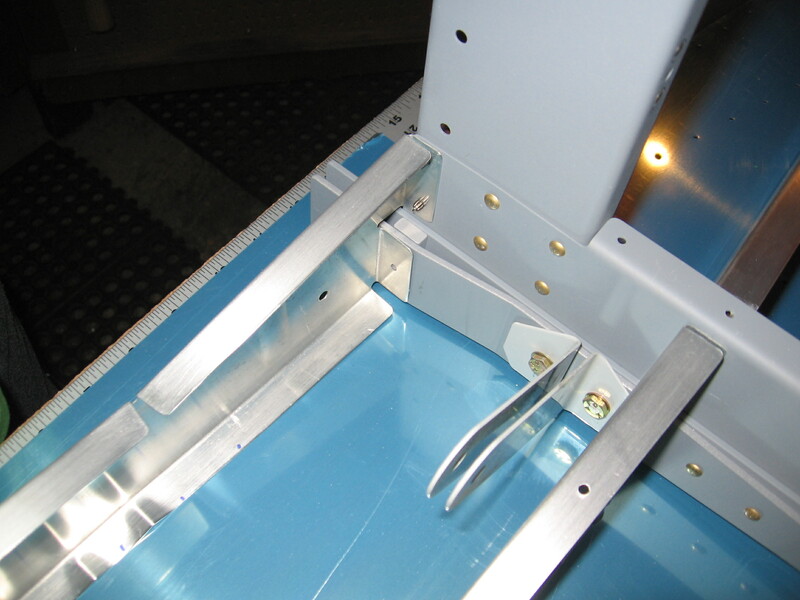 The next hurdle is bending the bottom rear of the 770 skins to conform to the curve of the aft fuse. My first attempt ended with a small crack at the 90 degree bend because I used the steel from my mini-brake and it has a very sharp edge. Joe at Van’s said I could stop drill it and glue in a metal backing but I opted just to order a new skin for $60. 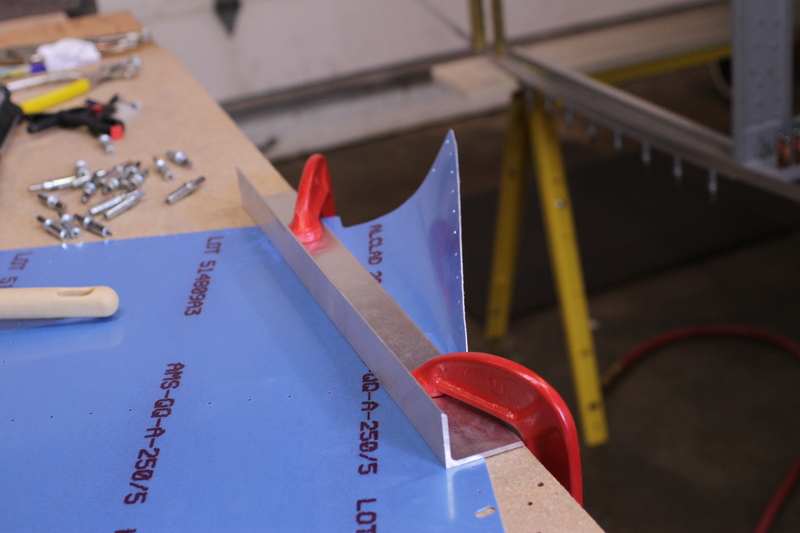 On the second attempt I used a piece of scrap angle that had a slightly rounded edge. This time the bend turned out better but I still ended up with a tiny little crack again. I will just drill and open up that corner a bit to get rid of the crack and help the edges meet better. 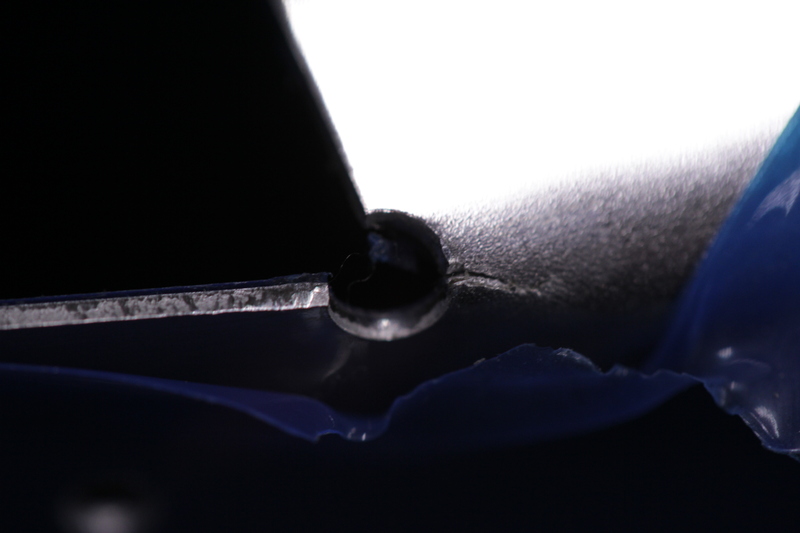 On the third try with the left skin, I rounded the edge of the angle even more and the bend turned out perfect. I’m very satisfied to have the 770 skins in place and those corners fitted. Next up will be drilling all the holes in the longerons. Yay! 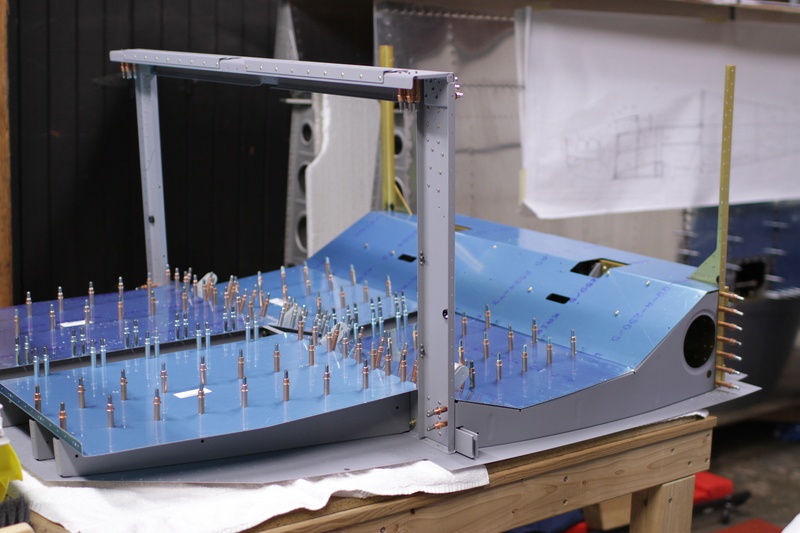 The center section is a simple enough set of parts: A couple of bulkheads, 16 ribs and the center skin. 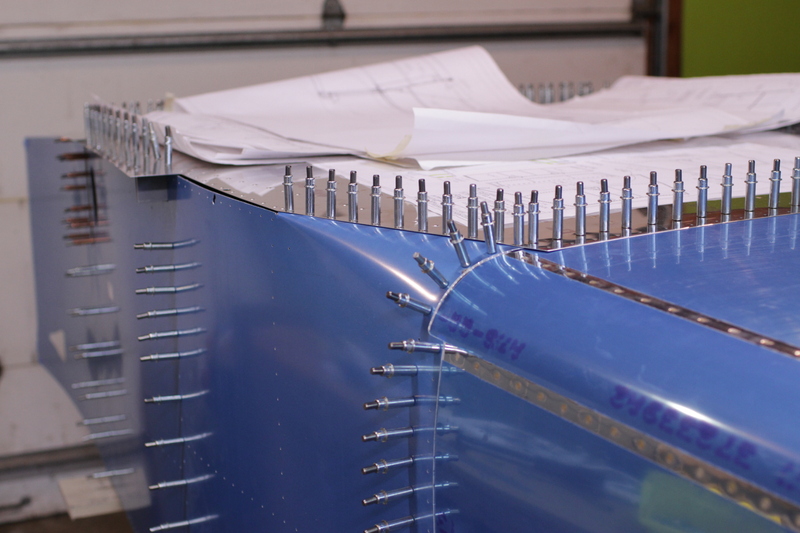 However, this is the heart of the fuselage with some very important intersections. 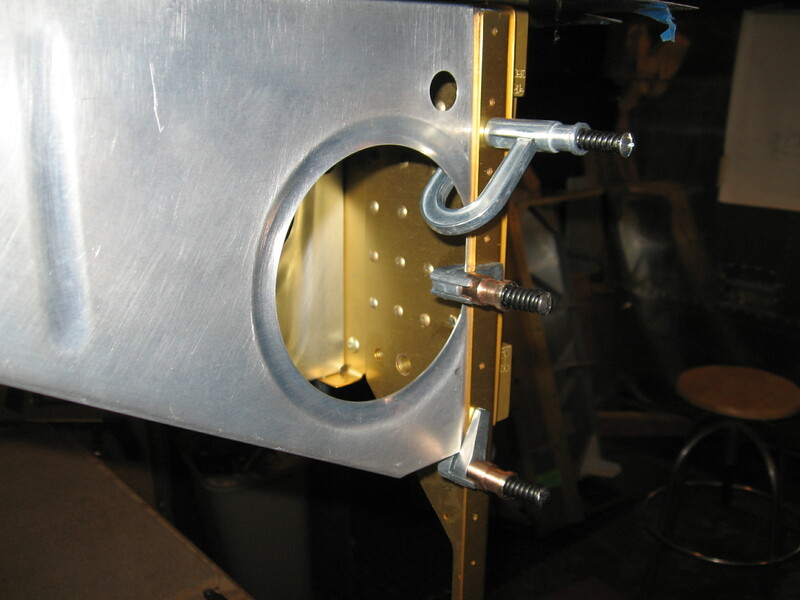 The gold piece in the photo above is one-half of the 704 bulkhead. 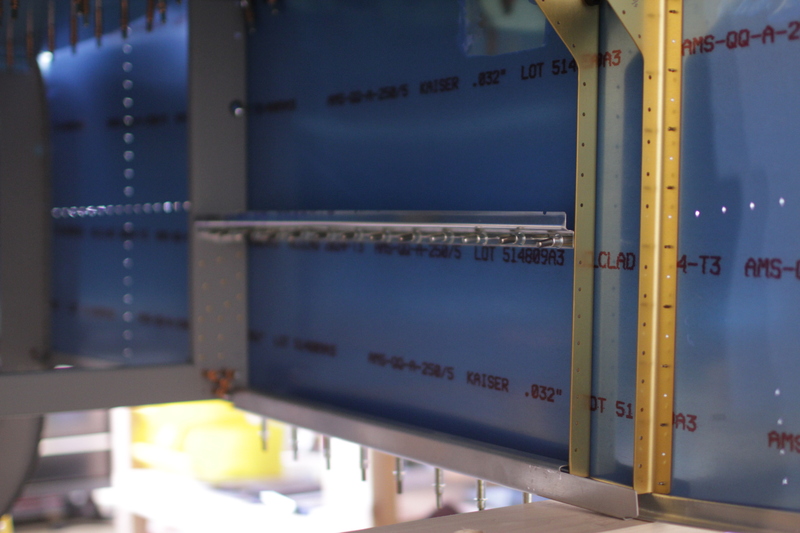 This is where the main wing spar attaches to the fuselage. The gray bulkhead in the back is the 705. 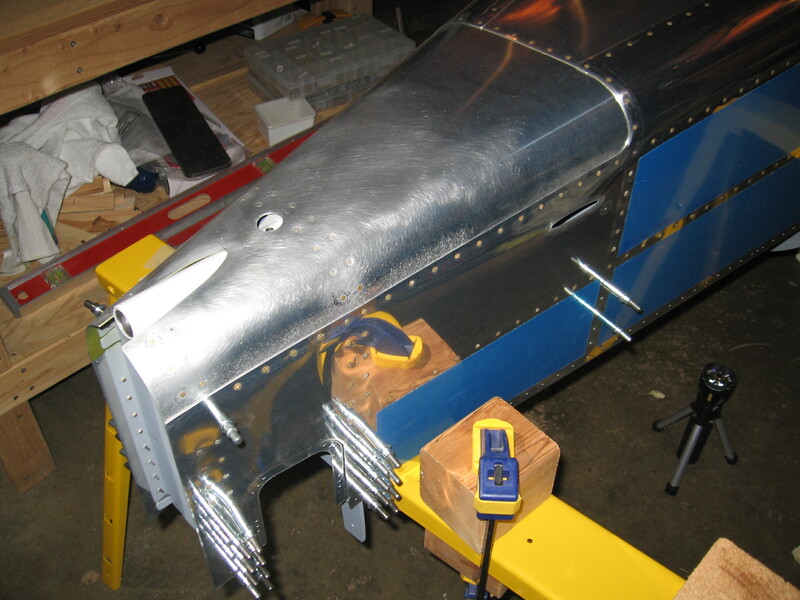 It’s where the rear spar of the wing attaches and the seat backs lean on. All the control systems and most of the airplane wiring route through this section. 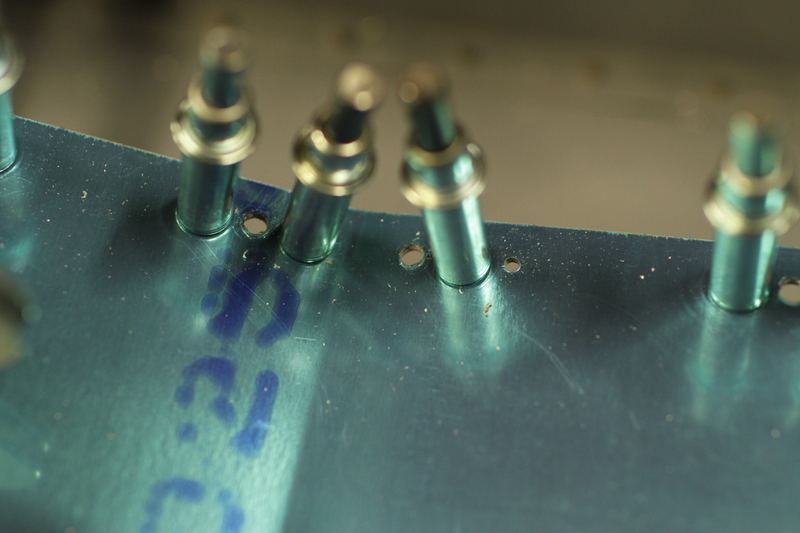 This means there’s lots of holes to be drilled and formed between parts. It all adds of up an endless list of little steps. 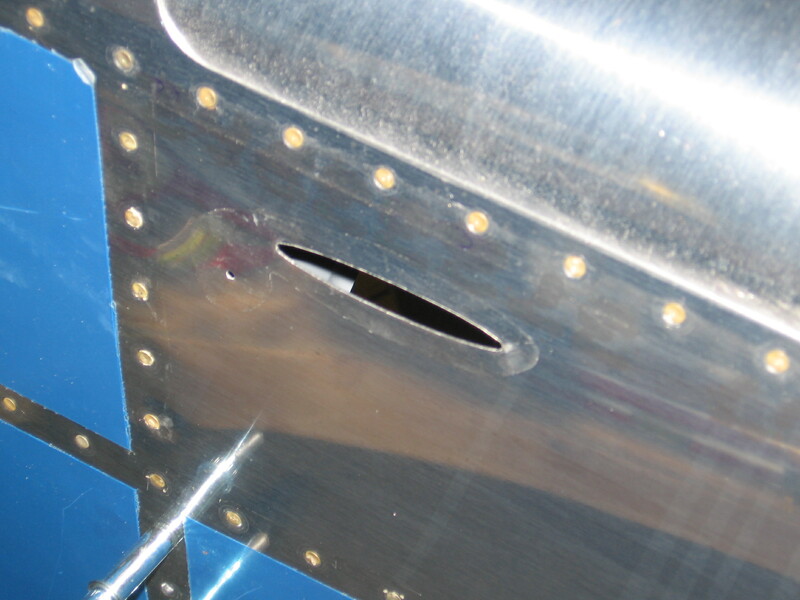 If you look close above you can see a spacer between the flange of the rib and the bulkhead. When I first clecoed everything together I forgot to insert these four spacers. There’s no way to slide them in after the fact so I had to take everything apart and reassemble. Oh well, it helped me figure out a riveting strategy for this section. Here’s 2 out of 8 half circles divots I had to take out of the middle row of ribs. These allow for wire to be routed aft for lights, autopilot, GPS, and ELT or whatever electronic gizmos I’ll want in 5 years. 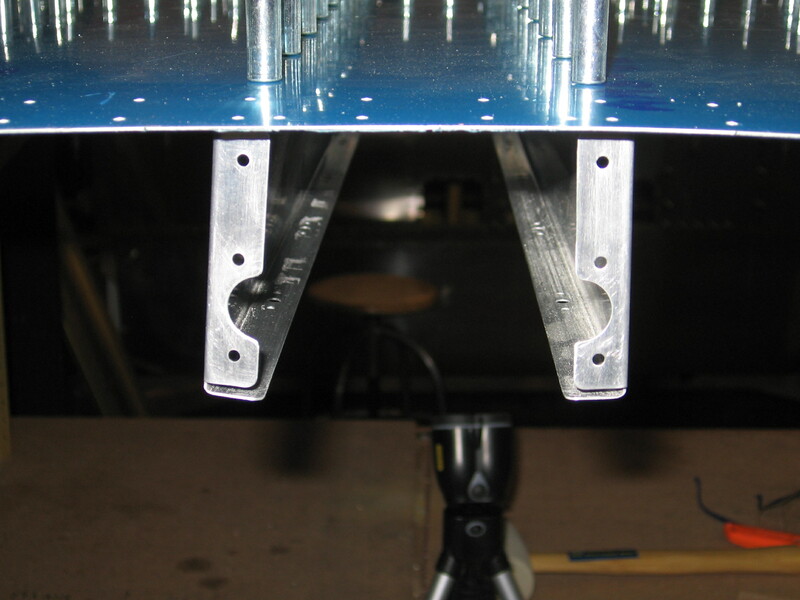 The F-715 ribs on the outside don’t get drilled until later. So they are just clamped in place for now. This is actually the topside of the center section. Because I need to drill out the skin, it’s much easier the build this part upside down. 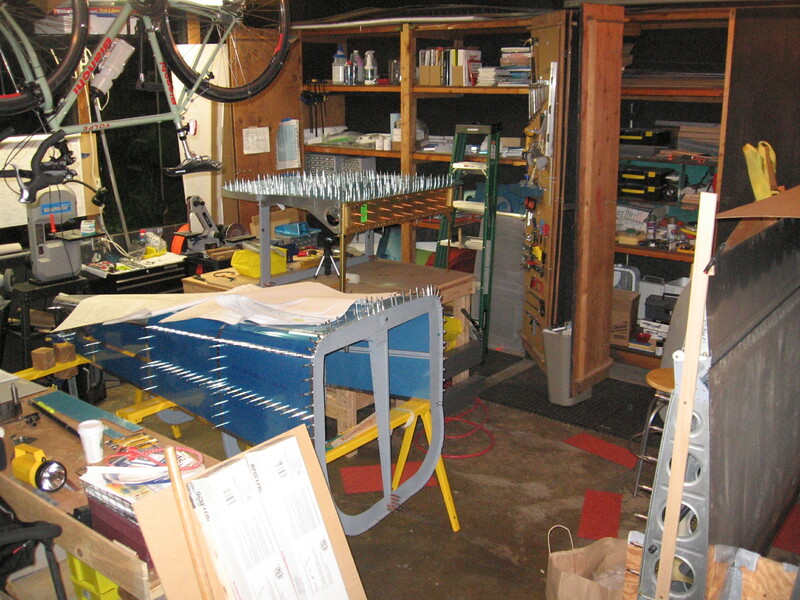 I tried to take a panorama of the workshop tonight but the pics came out blurry. 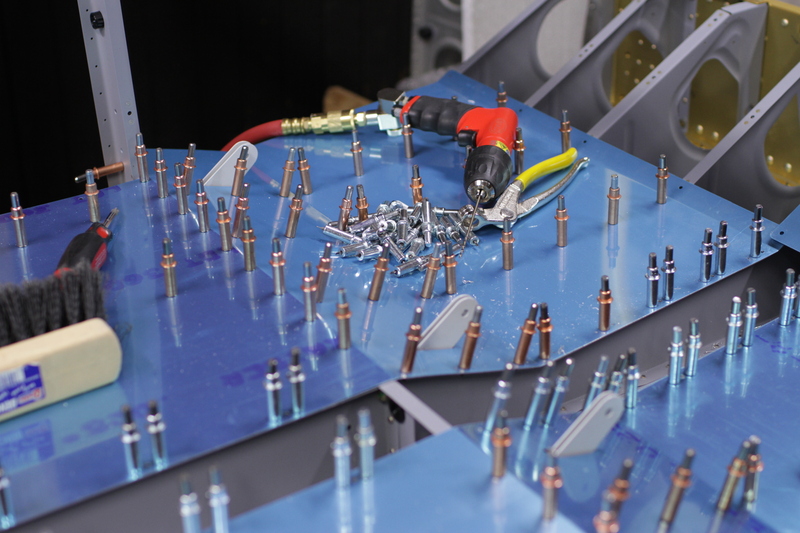 I’ll try again tomorrow and give my version of the state of the union for the RV-7 build. Right now you’ll just have to settle for this picture of the three main sub chunks of the RV sitting in the garage. To the right is one of the wings in the wing cradle. 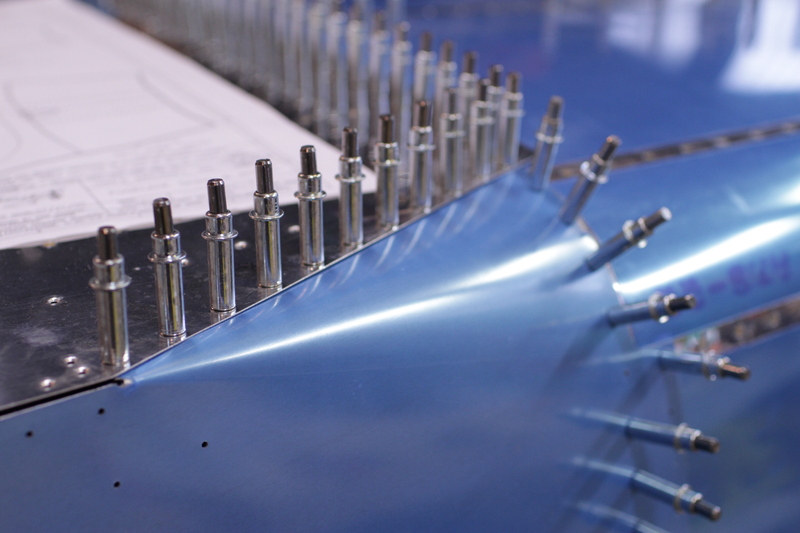 In the back is the center section and in the mid ground is the aft fuse patiently waiting to be finished. Next up is to finish the drilling, disassemble, debur and dimple everything. Then I have to figure out just where to prime these parts as the weather is so iffy this time of year. See you in a few days. Here’s the project progress from the last couple of weeks. I’m including a lot of pics as these are some of the more interesting sections of the fuse to put together. 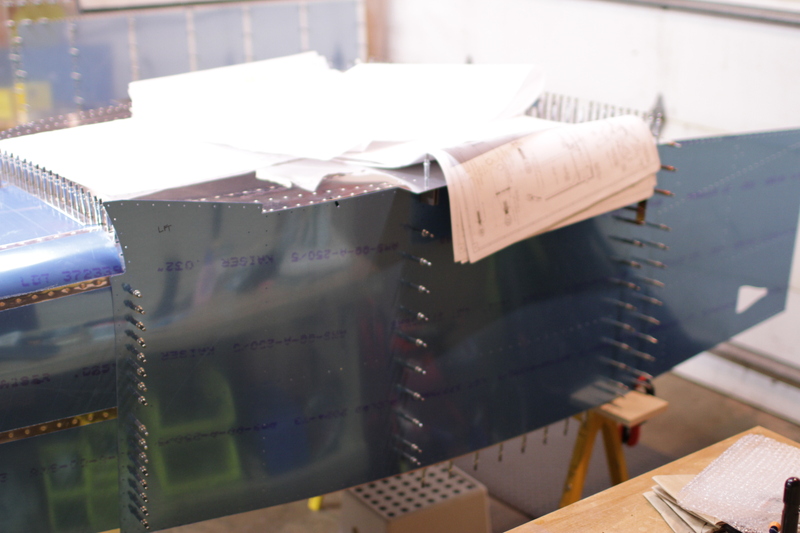 My friend Paul came over for round two of riveting the aft fuse. We got all the rivets at the far aft end done. We had to drill out 3 or 4 along the way. There’s just a few left on the 707 and 708 bulkheads and J-channel. Another couple of hours should do it. Next up, I’ve started the initial assembly of the center section after prepping all the ribs (did I mention how tedious that is?). It’s quite the Rubik’s cube to get everything in the right spot. 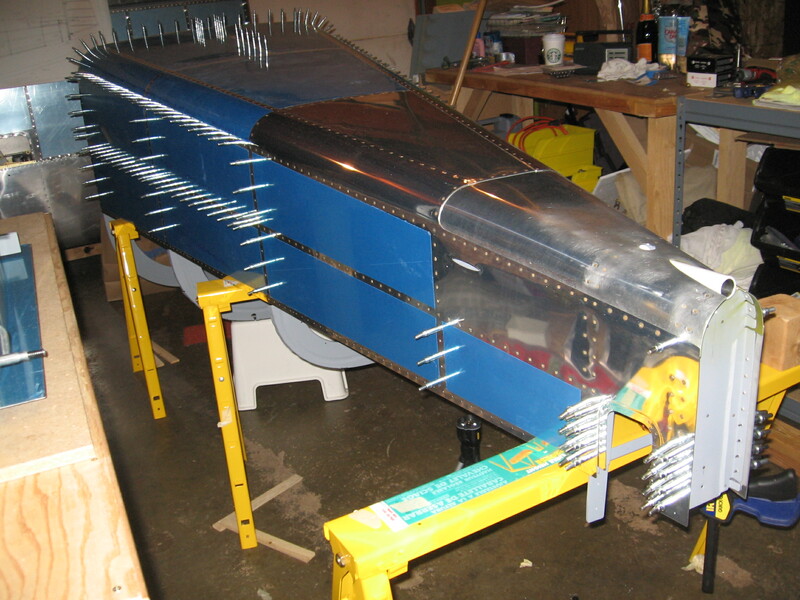 The 776 skin and right side baggage space ribs were just not going together. After silently cussing out Van’s CNC machines for a few hours, I discovered I had the 725R and 726R swapped. WHOOPS. Now everything is clecoed together waiting to be drilled, deburred and dimpled. 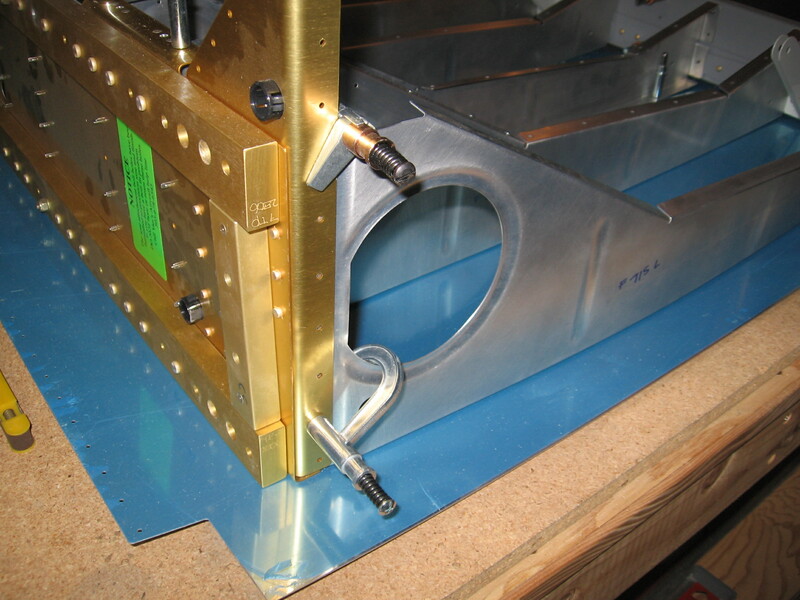 One thing I overlooked in my excitment to get the aft fuse together was prepping the rudder cable exit. 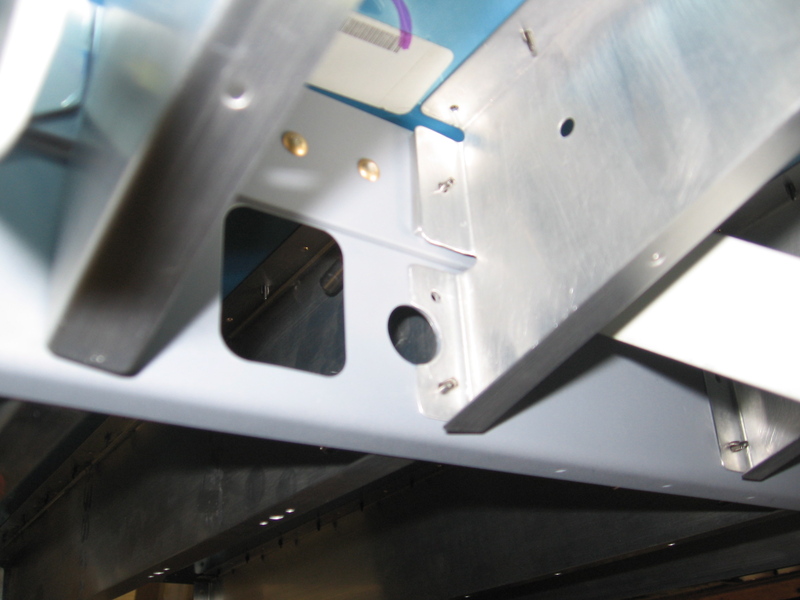 That little hole to the left of the pass through hole above is for the screw mount. 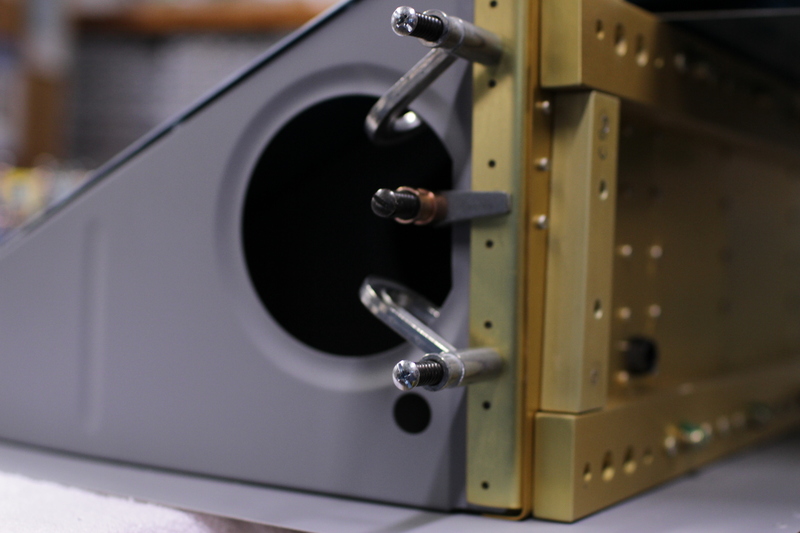 It should be drilled for a #8 screw and dimpled BEFORE the skin is assembled with rest of aft parts. Now I need to get clever about how to dimple the hole. All the ribs except the 2 outside 715 L and R ribs cleco in place. After everything gets put together, I will need to come back and drill out the front of the 715 ribs using the 704 bulkhead as a guide. 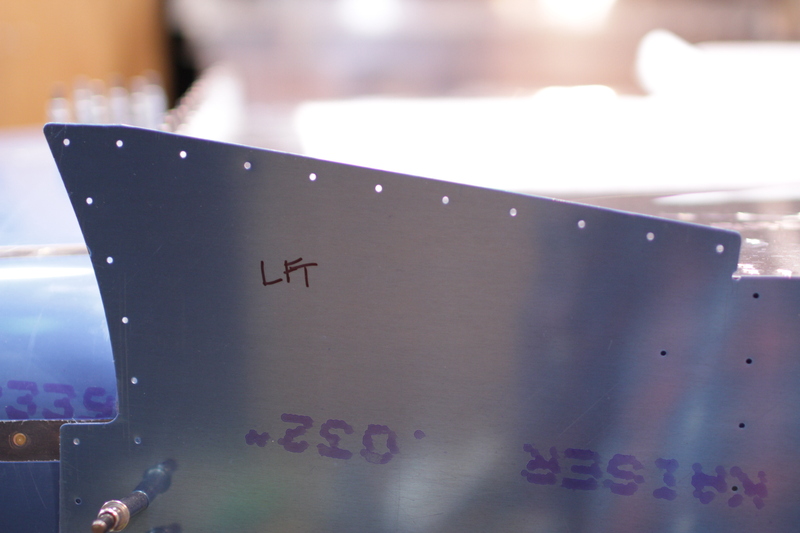 This is the outside intersection of the F-715R rib and the F-705 bulkhead. 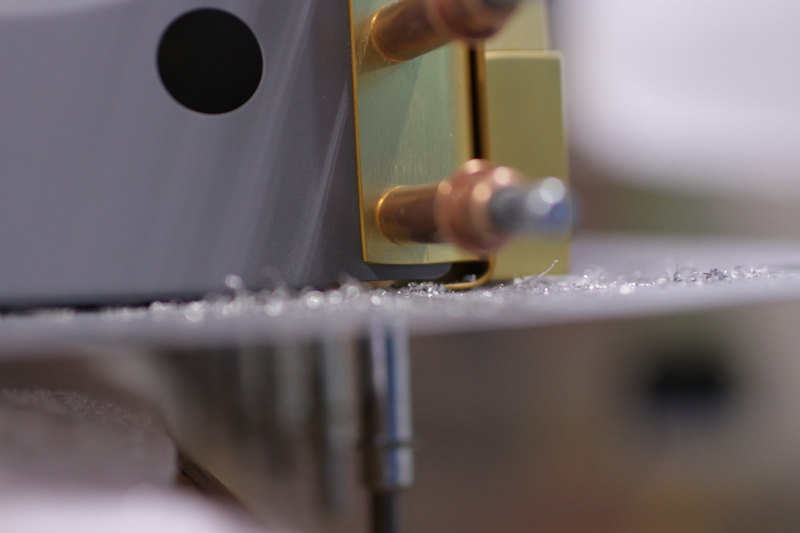 The bottom flange gets drilled out for a bolt. 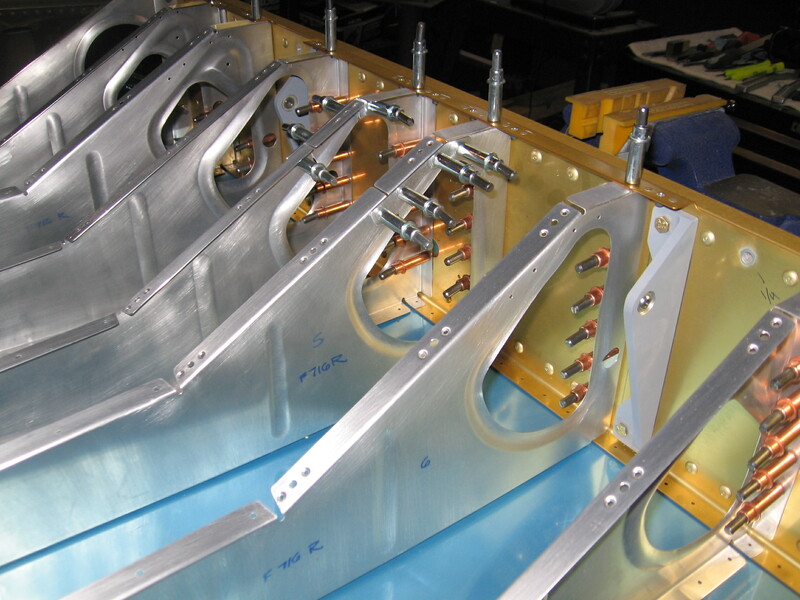 Here are the 716/715 ribs and the aft part of the F-704 bulkhead. These will be a mixture of -4 sized rivets and bolts. I’ll need to be ginger while drilling this stuff. 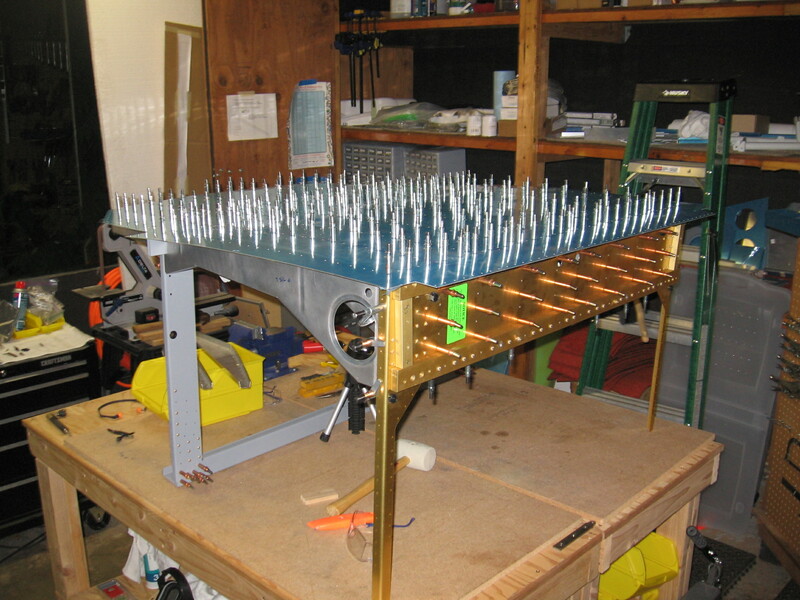 For whatever reason I am dragging my feet on riveting. I need to recruit partner, commit to a day, and be done with it. Plus I need all my clecoes back to put the center section together. 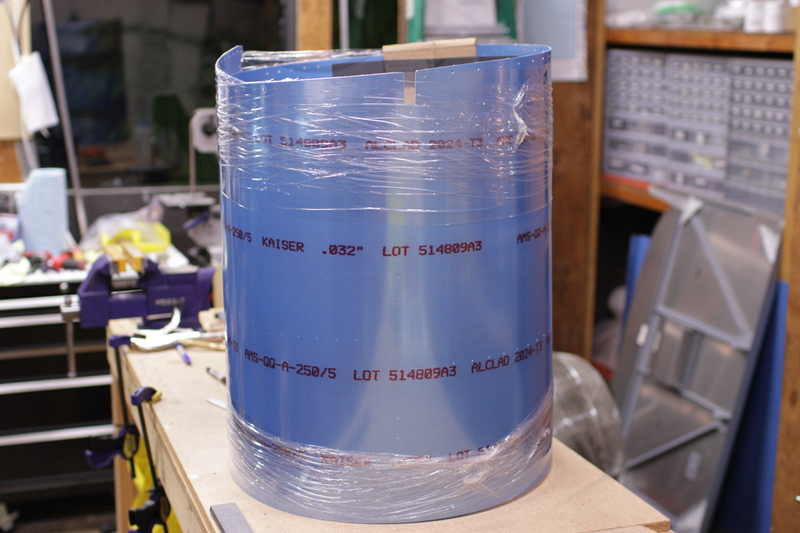 In the meantime, I can’t help but get started with the center section parts prep. 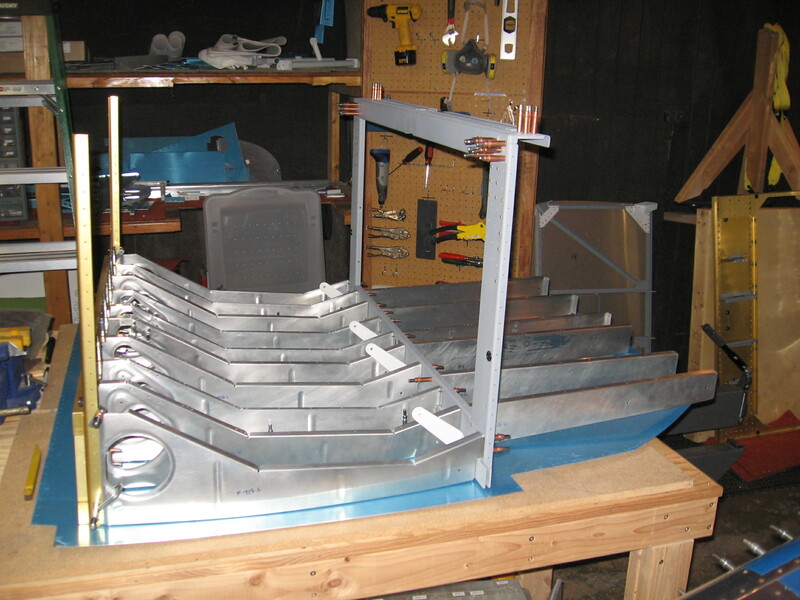 Sunday I started making all the cuts on the two F-715 and eight 716 ribs including the rib access plate cutouts, spacers, wiring holes, etc. Next up nutplates and figuring out how the hell I am going to fit this all in the garage! With the wings and aft fuse already in there, I need to get creative about where to fit this assembly. The footprint alone is about 4×3 feet.